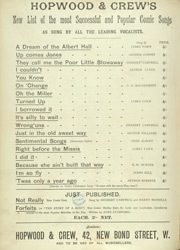 Henry or Harry Rickards, was a singer of topical songs, performing under the 'Lions Comiques' tradition. Originally a mechanic in the Woolwich Dockyard he became famous for singing patriotic songs, often having a 'dig' at Queen Victoria and her extended period of mourning at Windsor. He ran into financial difficulties after buying a share in 'Swiss Cottage', a music room in Hackney, went bankrupt and emigrated to Australia to avoid his creditors. He established a number of Music Halls there and employed the best performers from England. He died a very rich man in 1911.